I’m getting this yummy recipe up a bit late in the day. I apologize for my tardiness! 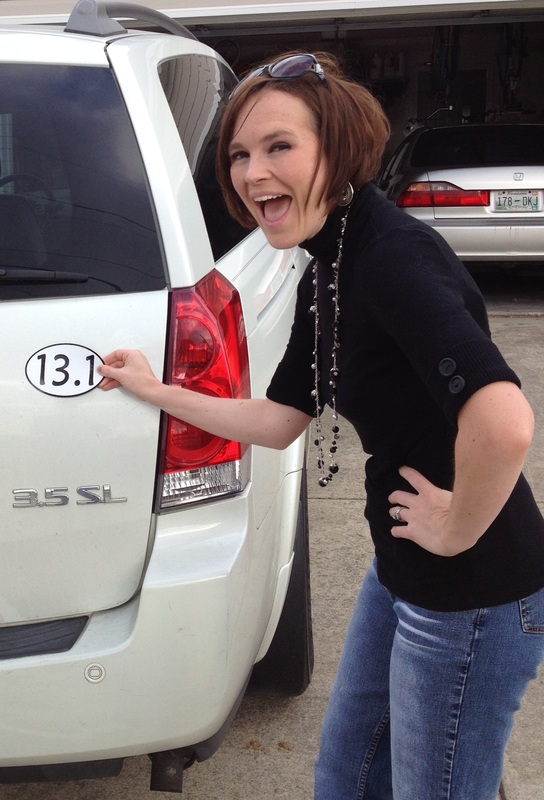 But in my defense, I ran a half marathon this weekend. And when I said I ran, I mean I literally ran the entire time. My goal was to 1) finish and 2) not to walk at all. Needless to say, I was practicing the method of sitting for 24 hours or so after the race. I kid you not, I could barely walk that night! In the picture above, I was excited to put the 13.1 on my van. My daughter asked me the other day why I always make things with peanut butter. It got me thinking about how much I really do make things with peanut butter and she is exactly right. I have a deep love for the stuff. I don’t think that’s too much peanut butter, do you? I don’t ever think I’ve gotten opposition to making brownies in this house. In fact, every time I make them you can bet that they will be gone within a day. I have nothing at all against chocolate brownies, but my innovative mind was seeking a twist on regular brownies. Of course! 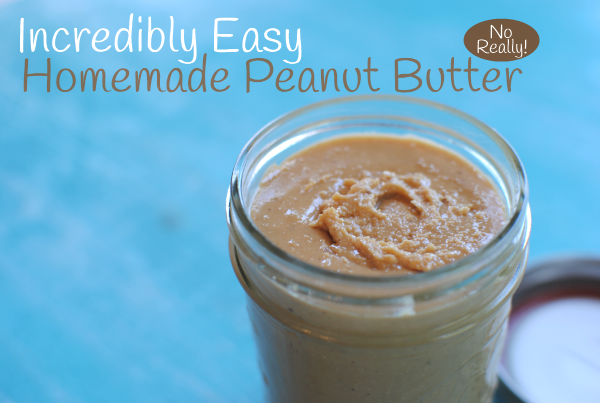 What better than peanut butter to spice things up! These brownies are really easy to make. The kiddos will surely want to help you out in the kitchen with these. And if not, they will definitely enjoy eating them! The batter is thick like you would expect a peanut butter batter to be. And there aren’t a billion ingredients so you won’t be stuck in the kitchen all day whipping them up. 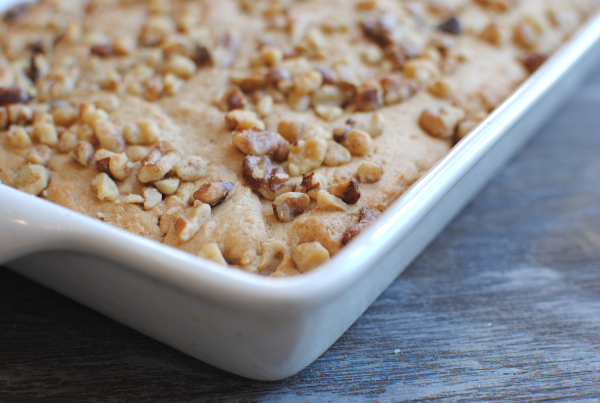 The recipe calls for nuts on the top, but if your family isn’t fond of nuts, simply leave them off. I’ve always been under the impression that my Addie liked nuts. It was only after making these that I learned that she does not, in fact, like nuts. She brushed them off this go round, but I’ll leave them off next time. I can’t wait to make these again. They really hit the spot when you’re craving that peanut buttery goodness. Recipe adapted from Family Living: Our Favorite Cookies Cookbook. Brownies aren’t always chocolate! 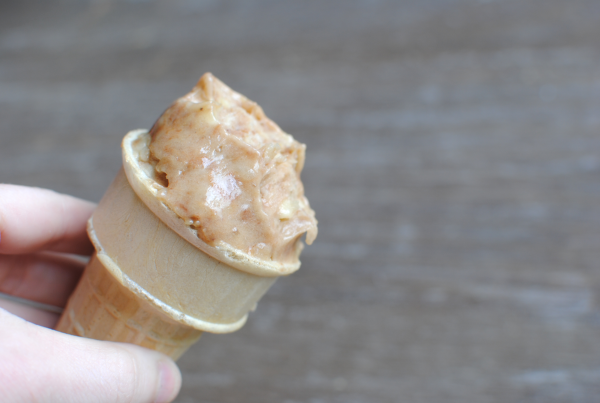 Try this peanut butter version for a unique twist. 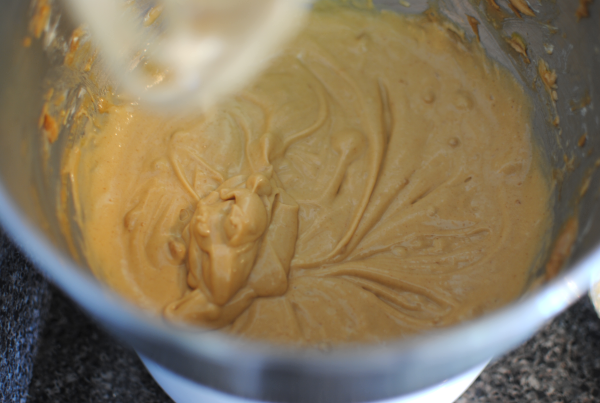 In a large mixing bowl, cream the peanut butter with the butter and brown sugar. Add eggs and vanilla and beat until smooth. In a bowl, mix the flours, baking powder and salt together. Slowly add the dry ingredients to the wet ingredients. Blend well. Grease a 9×13 baking dish. 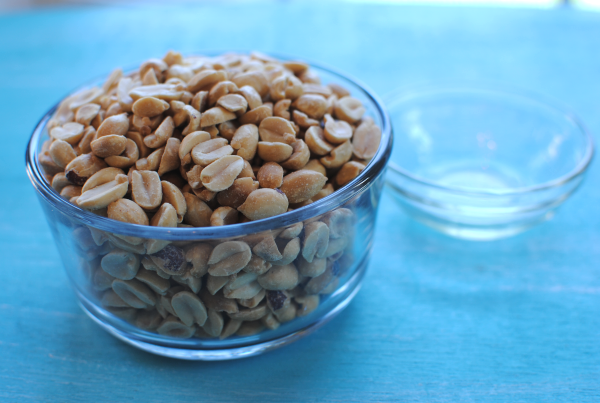 Spread batter into pan and sprinkle with peanuts (optional). Bake for 15- 18 minutes until the edges begin to brown. Cool. I used a little white whole wheat flour for my brownies to bump up the nutrition, but it’s perfectly fine to use only all-purpose. You would just use 1 and 1/2 c. total. Also, feel free to use whatever nuts that you have on-hand. I actually used walnuts because I was out of peanuts. Almonds or cashews would be lovely too. These days school is jam-packed full of learning, extra-curriculars, and even a taddy little bit of fun. They’ve even moved lunch time up for many kiddos to make room for other activities. Some children eat lunch at 10:00! What is this world coming to? But they are waking up at the crack of dawn so an early lunch isn’t so bad. But as parents we must be prepared to hear those impending words each afternoon…. I’m huuuuuungry. Can I have a snack? Can you blame them? They have been busy for 7 HOURS. All of that icky math and science can really work up an appetite you know? The least that we can do is give them a snack. Here’s a simple snack idea for your busy student (or hungry parent!). 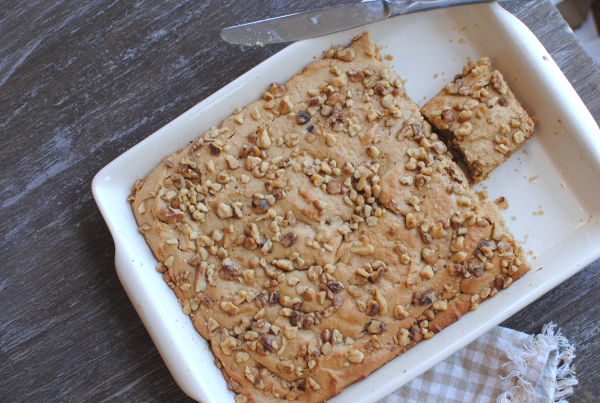 Start by cutting up a couple ripe bananas into bite-size pieces. Microwave 1/4 cup creamy peanut butter and stir in 1/2 tbsp cocoa powder. 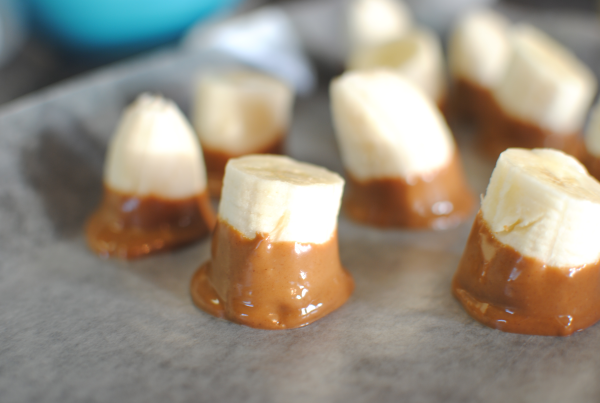 Dip each banana piece into the peanut butter and set on wax paper. You can drizzle any leftovers on the tops if you’d like. Freeze for at least an hour and you’re done! Bing bang bong and you’ve got a very tasty (and healthy) snack! It’s a nice little change from chocolate-covered bananas. 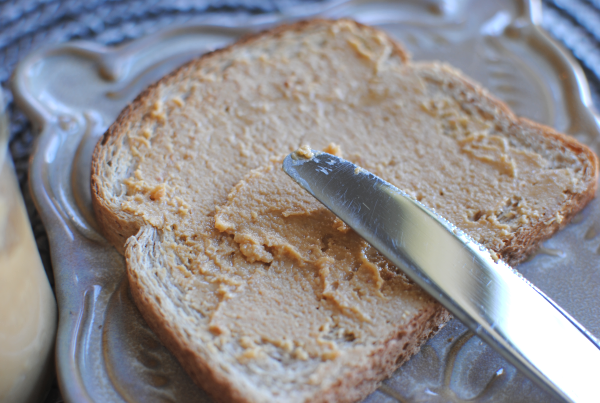 The peanut butter actually adds nutritional value with it’s healthy fats and boost of protein. Not to mention the potassium in the banana itself. But who cares about all that? 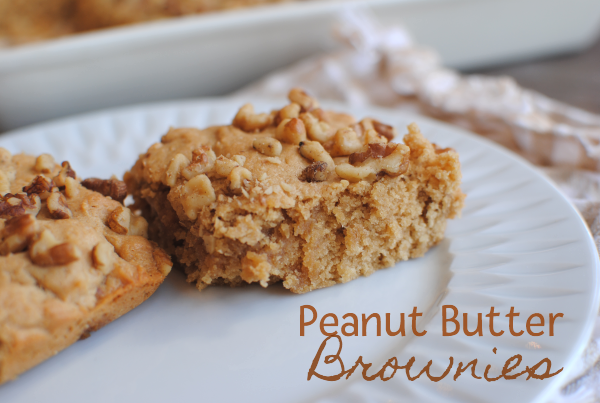 The peanut buttery goodness with a hint of cocoa is super yummy! Here they are after they are frozen. The peanut butter gets hard, but not as hard as chocolate would so you’ll want to eat them pretty quickly after removing them from the freezer. Ie- don’t leave them sitting around for long periods of time. 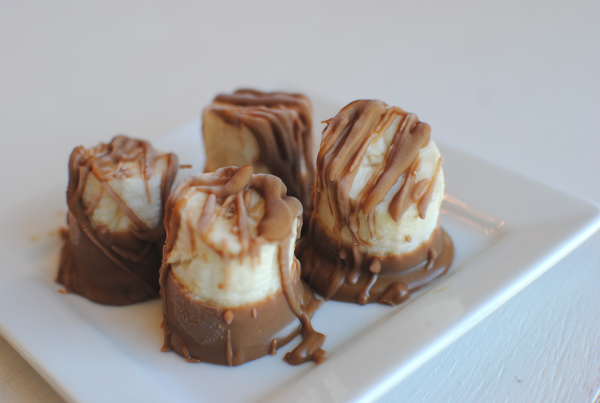 Frozen peanut butter bananas create a healthy afternoon snack! 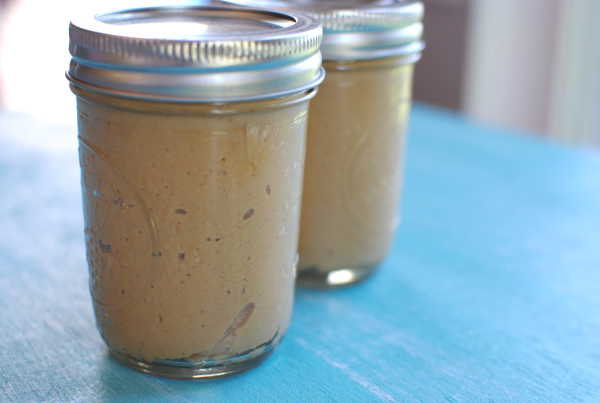 Place peanut butter in a microwave-safe bowl. Heat for about 30 seconds to melt. Stir in cocoa powder until mixed well. 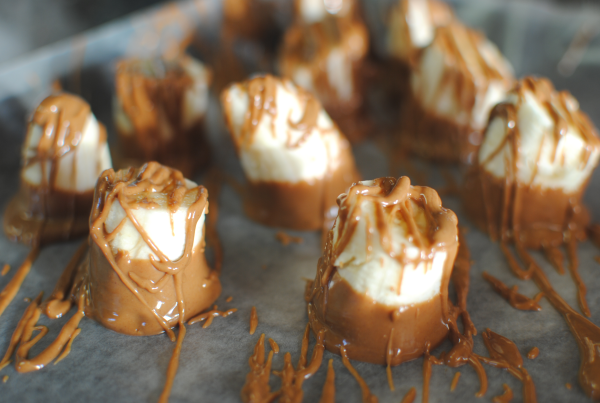 Dip banana pieces into peanut butter and place on wax paper. Drizzle remaining peanut butter over top if desired. Freeze for at least an hour. Preferably 3-5 hours or longer. It was a really great weekend around here. I actually got a girl’s night out with some friends and we had a blast. Isn’t it funny how silly us moms can act when you put a few of us in a room together without our children? We need that time every now and then to just be silly. 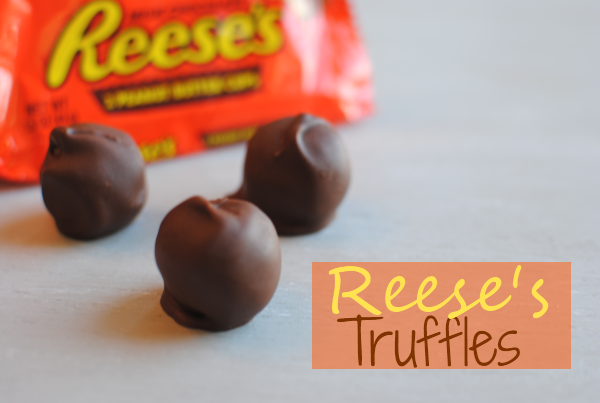 I was on a mission to create a Reese’s Truffle over the weekend as well and after a failure, I finally got it right. That’s usually how my creations usually work. I have to fail a few times before I get it right. But that’s what we call trial and error. But let me just tell you, these truffles are no error. They are so yummy! And they are so incredibly easy, it’s insane. I think one of my favorite things about them is that you can get all the ingredients that you need anywhere, including a convenience store! You know sometimes, it’s just not possible to make it to the grocery store. 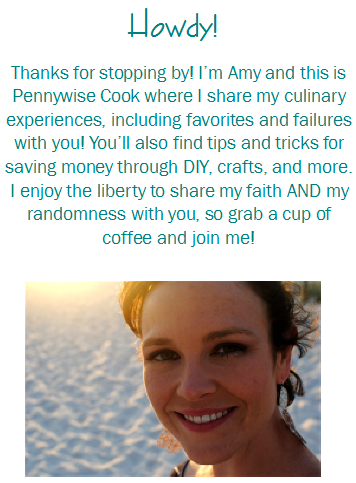 Whether it’s because you’re on vacation and have no idea where a grocery store is or because you don’t want to fight the crowd, a convenience store is always around the corner and you can get all of the ingredients in this particular recipe from one! You start out by taking 6 packs of 2 Reese’s cups and 3 slices of pound cake and putting them through the food processor (or blender). It makes a crumby mixture that is really soft and easily formed into a ball. Make them as big or as little as you want. Pop your little balls into the freezer for a little bit. 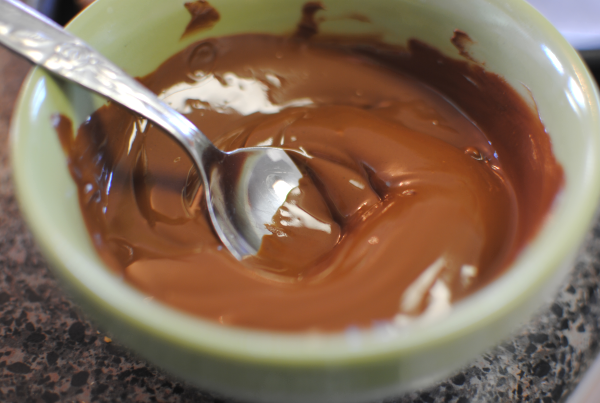 Around 15 minutes or so to get them good and firm so you can dip them in the Hershey goodness. This is the Hershey goodness. Try to refrain from reaching through the picture to eat one. This is just a picture, I promise. Melt it in the microwave for a bit to get it so nice and gooey. 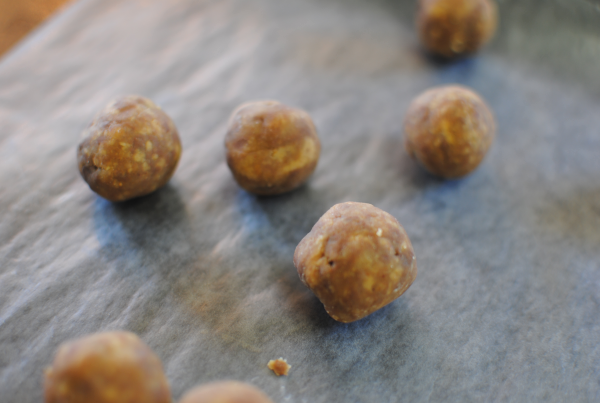 Then it’s time to get your peanut buttery balls out of the freezer for their chocolate bath. I would never object to a chocolate bath, would you? When you’re done dipping them, put them back in the freezer for another little bit to help the chocolate firm a bit quicker and then you can put them in a tupperware or in cute little mini cupcake wrappers like these for serving. 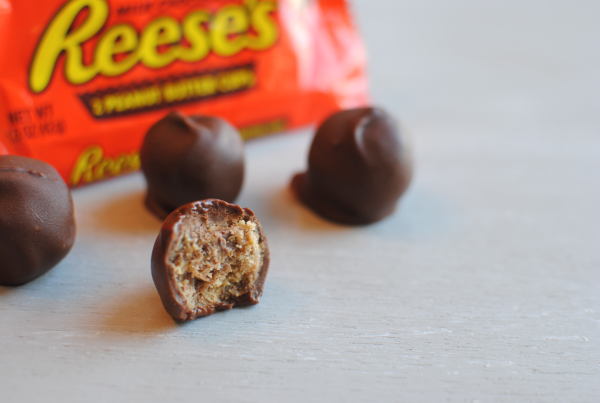 3 Ingredients come together to create a peanut buttery truffle made of Reese’s cups. 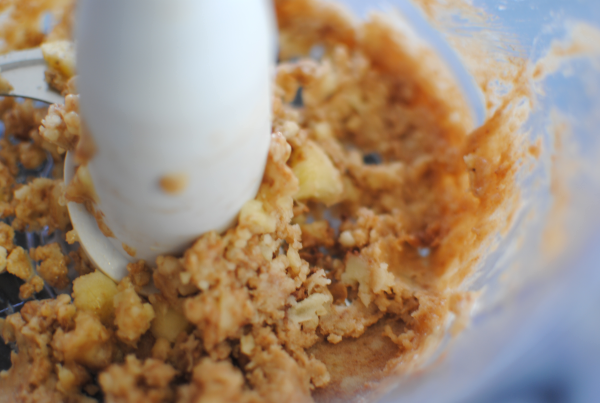 In a food processor, combine and process the pound cake and Reese’s cups until crumby. Shape into 1-inch balls. Place on a pan and freeze for around 15 minutes. 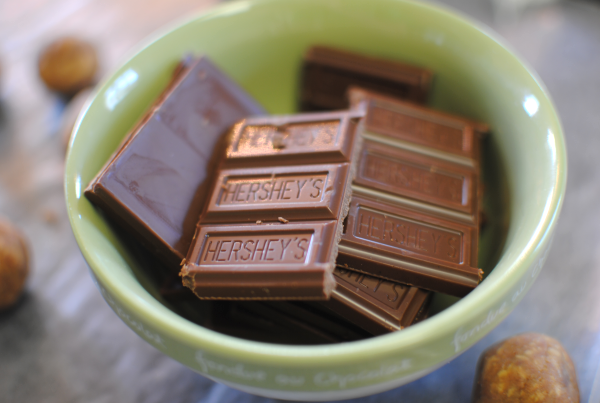 Meanwhile place Hershey bars in a small bowl and microwave for 30 seconds on 50% power. Continue microwaving in 10 seconds increments until completely melted, stirring after each time. 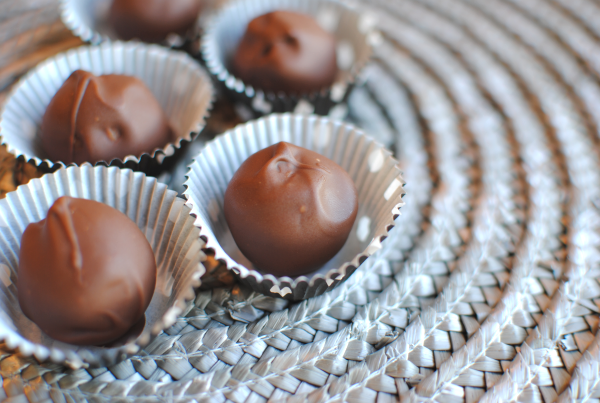 Remove balls from freezer and dip each into the chocolate. Place on dish covered in wax paper and place back into freezer for around 15 minutes to firm. Serve and try not to consume them all yourself! You could also make these with chocolate pound cake and that would be very delicious as well! This experience has been part of a study with Murphy USA and The Smarter Driver. See more Convenience Store Cuisine at The Smarter Driver or at Murphy USA on Pinterest. All opinions expressed are 100% my own. I am an absolute ice cream fanatic. There, I said it. It’s in my top favorite sweets out there. I have issues practicing portion control when a tub is placed in front of me. So as you can imagine, I try not to get into that position very often. 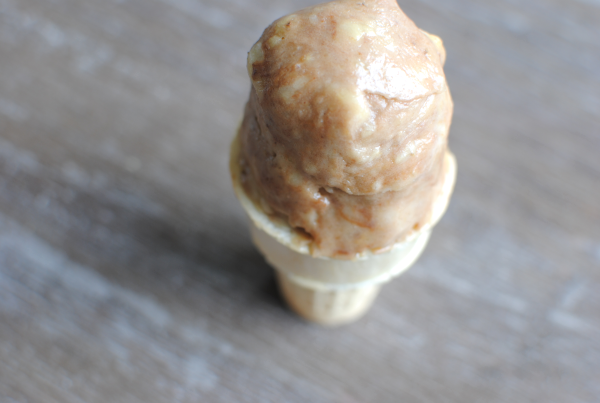 A while back, I shared a recipe for 1-Ingredient Banana Ice Cream over at Saving with Amy. For ice cream lovers like myself, this is quite a discovery that makes eating ice cream a little less guilt-stricken. You see, all it takes to make a batch of creamy and smooth no-add sugar banana ice cream is to freeze a few sliced bananas and then pop them into a food processor! I know, right? I can just feel you saying SHUT UP! But around here, where there’s banana you’ll almost always find peanut butter. They go together like milk and cookies or Lucy and Ethel……..
….or perhaps me and ice cream. I have a history of pairing peanut butter and banana together. If you’re a fan of the duo, those are some recipes you could try. 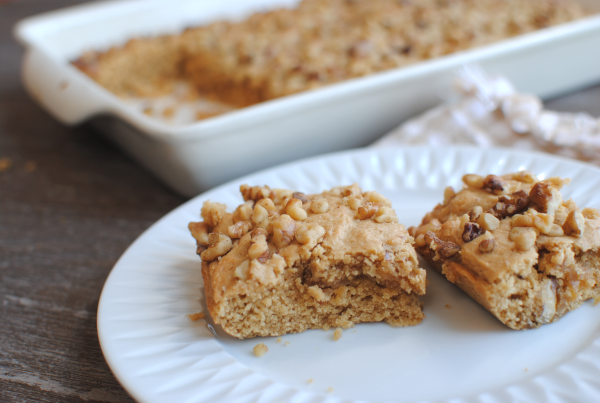 Not only did I add in some peanut butter, I also added in another fave of mine…chocolate! There is nothing better than the combination of those three in harmony taking a dip in my ice cream cone. So soft and creamy. That’s the stuff! And I just love that this is available whenever I’m ready. The bananas can be frozen for weeks or sometimes even months in the freezer and then popped out to be made into ice cream when you have a craving. And of course, you probably have a little powdered cocoa in the pantry along with some peanut butter. The base of this natural ice cream is simply frozen bananas. 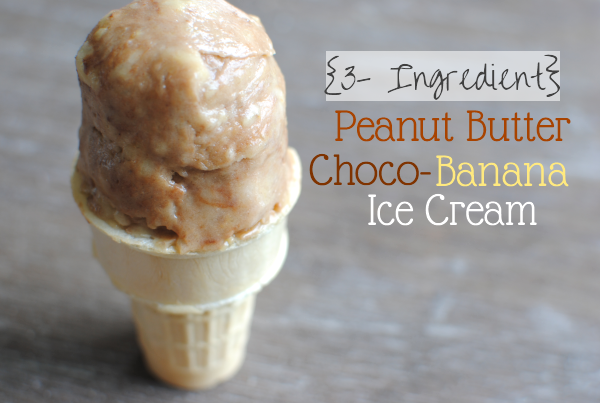 Add in some yummy touches like peanut butter and cocoa for an extra treat! Place the bananas in a food processor and pulse until the bananas start to break up. Add in the peanut butter and cocoa. Process until small beads are created then scoop into bowl and ice cream and serve!